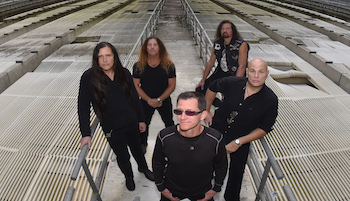 Interviews: Metal Church interview with singer Mike Howe - Sea of Tranquility - The Web Destination for Progressive Music! Metal Church are back. Back with a new album, back with a string of live dates and festival shows across Europe and the USA, and back with singer Mike Howe. 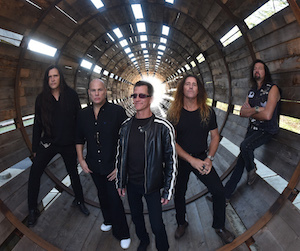 Over two decades had passed between the frontman's last outing with the band, 1993's Hanging In The Balance, and 2016's storming return, XI, but he and the rest of Metal Church picked up as though it had been a matter of months they'd been apart, not years; releasing the outfit's strongest album in quite some time. With the band's UK dates just about to begin and a host of festival and headline shows to follow, Sea of Tranquility's Steven Reid spoke to a clearly invigorated Mike Howe about his return. 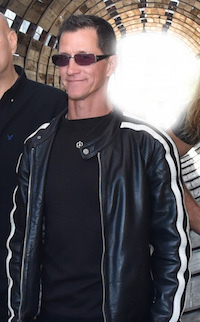 When Ronny Munroe departed Metal Church in 2014, some people questioned if the band could regroup and continue in the wake of the band's sixth singer leaving. Few could have predicted that rather than fold, Metal Church would turn to the man who fronted three of their best and most highly regarded albums, Mike Howe. "It has been an amazing ride and I feel like the luckiest man on earth," the singer begins, when asked how it feels to back where he belongs behind the mic. "Kurdt [Vanderhoof, guitarist] called me in the fall of 2014. I was reluctant at first, but we had many conversations about how things would be different this time." And by different, Mike means that he, Kurdt and the band are now back controlling their direction and destiny. "We are now fully in control of the songwriting and recording process, from beginning to end with no outside pressures," he continues, clearly revitalised by the change in the band's fortunes. "We are once again having fun making and playing music. To us that is what it is all about." And Mike's first album back with the band, XI, is an absolute monster of a release. So many years after they had recoded together, did he and the band possibly even surprise themselves with just how good it is? "Thank you!" he begins, clearly touched by the well deserved praise. "All I can say is that we honestly had a lot of fun writing music together again, and I believe that's where good music comes from." That tour spawned the tremendous, recently released 'Classic Live', a CD that mainly highlights the three earlier albums, 'Blessing In Disguise', 'The Human Factor' and 'Hanging In The Balance', Mike recorded with the band, along with three older tracks from the first two Metal Church releases. Good though it is, was there not a temptation to highlight the excellent 'XI' on 'Classic Live' as well? "Maybe in a future live album," Mike says thoughtfully, giving hope of another live outing coming not too far down the line. 'Classic Live', however, is sure to be a real favourite with the fans. After all, there's no denying the quality of these older songs, or that the band's fans hold them dear. How did Mike feel having the chance to go back and revisit them on stage? "They are great songs and it is always a privilege to play them again." Which is something Metal Church will get the chance to do again soon, as they hit the road across the UK, Ireland and Europe, with shows lined up from the middle of June 2017 and beyond. Clearly enthused at the prospect, Mike confirms that he can't wait to get started. "I love coming to Europe," he says with real passion, "playing in all the different countries and meeting all the different people.� It gives me hope." When they hit the road last year, Metal Church had both guitarists Paul Kleff and Chris Caffery guest with them on various dates. Will the band be back to its usual guitar configuration this time round? "Yes", Mike confirms. "Our full-time guitarist Rick Van Zandt will�be out with us again this time. Those two guys were just filling in for Rick while he had eye surgery." Although there will be one new addition to the Metal Church line-up as they prepare for their latest jaunt round Europe, drummer Stet Howland being welcomed into the band. "Jeff Plate [the band's drummer between 2006 and 2009, and again from 2012 to earlier this year] decided that it was time for him to move on and do other things in his life," the singer explains. "We are all still good friends and we wish him well. Stet stepped in perfectly and we are really enjoying playing with him. Our bassist, Steve Unger, is a friend of his." So what can fans expect in the way of set list on these shows. Will Metal Church be focusing on the earlier days of the band, or will it be a mix of old and new material? "We feel that for us it is a perfect blend of old and new music," Mike says confirming what most fans will want to hear, before adding, quite understandably, "mostly focusing on my era in the band." And once the UK and Ireland dates have been wrapped up, Metal Church have a summer's worth of festival dates lined up. Much though playing to their own diehard fans must be the ultimate experience, it must also be an unmissable opportunity to take the band and its music out on to these huge stages, in front of those massive audiences? Something the singer confirms quite emphatically and with a glint in his eye. "It is definitely a rush!" With things having gone so well for Metal Church since Mike's return, the band are keen to keep that ball rolling as they look ahead to what comes next. "We will be working on new material at the end of the festival season," the frontman says, before finally revealing, "Kurt already has some rough material written� We're looking for a new release early next year." June 20th � London, Underworld.